I don’t think broccoli itself is boring but we have it at least once a week – it’s the talk of health town. It’s supposed to be rich in antioxidants, helping us ward off cancer. It’s eating it once a week – steamed – that provokes this boring sentiment. Aren’t all health foods somewhat boring anyway? I found a recipe from the Dairy Farmers of Canada which was published in a Canadian Living Magazine newsletter I receive regularly. The recipe is here: http://www.canadianliving.com/food/__all_you_need_is_cheese/family_meals/broccoli_rice_pilaf.php. At first I had doubts that this Broccoli Rice Pilaf would excite my taste buds but I’m glad I tried it. So what’s the vote? Is it a keeper or a pooper? Keeper! The recipe is now in my bulging binder and will be cooked again and again, especially during this winter. This dish takes the boring out of broccoli and if you’re a rice lover like me, you’ll like the way it teases the palate. It must be the combination of the grated cheese, rosemary, and rice that did it. The first spoonful tells you that you’ll be back for seconds. My brother had three huge servings. Despite the quantity that this recipe produced, it was devoured in no time. I was hoping to eat it again on the second day, but by the time supper was over, platter was squeaky clean. The next time, I’ll double the recipe. instead of the 1 cup hot water in the recipe, I would increase that to 1-1/2 cup (I found that after about 10-12 minutes, the liquids (you also add 2 cups of chicken or vegetable broth) are absorbed quickly, even in medium heat. instead of the 15-minute simmering time, I’d reduce that to 12 minutes. 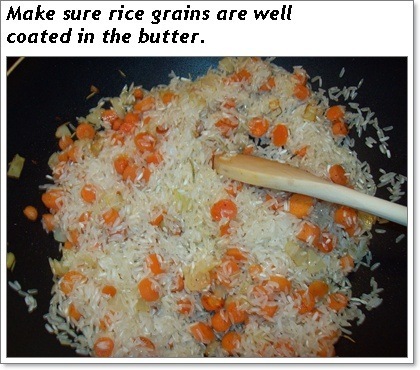 The first step is to mix the butter, carrots, onions, rosemary, salt and pepper in a large pan for five minutes; you then add the rice, making sure the grains are well coated. The rest of the recipe is easy (complete recipe is given in the link above – prep time 15 minutes, cook time 30 minutes). If you’re serving it to guests, by the way, it would look nice on a plain colored platter. In the picture above, I used a decorative platter. Big mistake. It clashed with the dish’s colors. For the sake of good photography, I’d use a one-color serving platter for dishes that bring out a lot of colors. 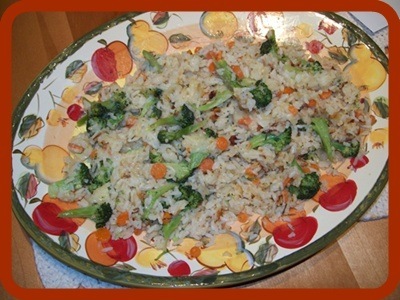 I think this broccoli rice pilaf dish would look festive against a black platter but I don’t have one. I’m having guests from Toronto during the holidays and this recipe’s a good candidate for the menu so I just might run out and get myself one of those gleaming, all-black serving dishes. Do visit the web site of Canadian Living Magazine – www.canadianliving.com. They have a genuine variety of recipes that are well presented (prep and cooking times are provided along with nutritional information and tips for each dish). I was also curious about the Dairy Farmers of Canada web site and I will use only one word to describe it: sassy! I’ve bookmarked it. The Dairy Farmers of Canada web site has a lot to offer. Easy to navigate interface with large fonts so that you’re not squinting; and the recipes, colors and images – well – they do work up an appetite! http://www.dairygoodness.ca/. They’ve got excellent articles about dairy health too. And they run a huge network of web sites (I counted about eight) that promote milk, cheese health and nutrition. And let me repeat what I said in the past. I’m not getting paid or getting my arm twisted for promoting certain web sites. I promote them because I like them. You would like them too if you’re on the prowl for recipes!